Please refer to our stock # 687 when inquiring. 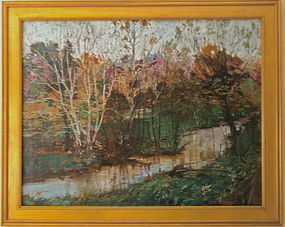 Everett Lloyd Bryant landscape oil painting on canvas signed lower right. Measuring 28"L x 36"W. Everett Lloyd Bryant studied at the Pennsylvania Academy of the Fine Arts with Thomas Anschutz, William Merritt Chase, and Hugh Breckenridge. A member of the Baltimore Watercolor Society, Philadelphia Watercolor Club, and California Watercolor Society, Bryant exhibited at the Salons of the Societe Nationale des Beaux-Arts in Paris (1895), the Pennsylvania Academy of the Fine Arts (1904-24), Art Institute of Chicago, Panama-Pacific Expo (1915), Corcoran Gallery (1916-23), Arlington Galleries, NYC (1918), LA Art Association (1934), Golden Gate Expo, SF (1939), California Watercolor Society (1939) Baltimore Museum of Art (1946), and the Society of Independent Artists. His work is in the collection of the Pennsylvania Academy of the Fine Arts, Baltimore Museum of Art, St. Paul Art Institute and Los Angeles County Museum of Art. Provenance great grandson of the artist. Condition: Excellent original antique condition.